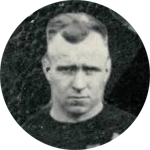 Edward “Dutch” Sternaman was a halfback on the 1920 and 1921 Staley football teams and one of only two players to start every exhibition and professional game both years. In the spring of 1922 he and George Halas co-founded the Chicago Bears football team and were equal partners of that franchise through the end of the 1931 season. Sternaman was an outstanding athlete at Springfield High School earning 13 varsity letters – four in football, basketball and track and one in baseball. In his senior year he was named to the All-State High School basketball team and is today enshrined in that city’s sports hall of fame. In 1915 he entered the University of Illinois as a mechanical engineering student. Under Coach Bob Zuppke he lettered in football in 1916 and 1917 and was elected to the Tribe of Illini, the school’s honorary athletic fraternity. In 1918 he was named Captain-Elect of the next season’s football team but was drafted into the army in May of that year. Assigned to Camp Funston at Fort Riley, Kansas, he was made physical director for the camp. In the fall of 1918 he helped organize the football program and was captain of the cantonment team. Discharged on Valentine’s Day 1919, he returned to college and again lettered in football for the 1919 Conference Champion Illini. In addition to sports, Dutch was also a member of Sachem, the leadership honorary for junior men, Ma-wan-da, the honorary society for senior men and social fraternity Iris, now Delta Phi. According to Sternaman’s memoirs, after his last collegian football game he was secretly invited to play in a semi-pro football game for the Arcola, Illinois town team scheduled for Sunday, November 30, 1919. He was asked to invite several other college players to compete that day for $150 each. This he did without knowing the scheduled opponent was the A.E. Staley club team. The Staley team caught wind of Arcola packing their team with “ringers” and never showed up. When Arcola brought this to the attention of A.E. Staley, he promised to pay all expenses caused by the forfeited game. Sternaman also related that it was during the 1919 Christmas vacation that A.E. Staley invited the U. of I. senior to visit the starch work headquarters in Decatur and asked him to take the Staley industrial league football team to a higher level. Dutch had been discouraged from getting involved with professional football by his Coach Bob Zuppke and others who felt that pro football would ruin the integrity of the college game. Additionally, his parents felt that he should finish his Mechanical Engineering degree that spring and get a “real job.” Staley argued that Dutch could both work with boilers and play football while working at the Decatur plant. We may never know what promises were made during that private meeting. However, Dutch went back to the University of Illinois in January 1920 and finished his degree while in February, Sternaman’s 1917 U. of I. teammate, the already graduated George Halas, accepted the Staley football coaching position and soon started working in the plant. In June 1920, Dutch began his employment with Staley’s and participated fully in company social and athletic activities while getting practical experience learning combustion engineering working in the boiler rooms for the next 16 months. Staley’s first football game was against the Moline Tractors on Staley Field, October 3, 1920. At left half back, Sternaman rushed for all three of Staley’s touchdowns in its 20-0 victory and went on to score 75 of the team’s 155 points in the 13 games that season. The following year he also led the team in scoring. When A.E. Staley gave up the sponsorship of the football program, Sternaman and Halas incorporated the Chicago “Bears” franchise on April 1, 1922 as the American Professional Football Association changed its name to the National Football League. The former Staley teammates were equal partners of the franchise and shared both management and coaching duties. On March 31, 1925 Dutch received a U.S. Patent for a special cleated football shoe that he then marketed. In addition to his sometimes coaching and administrative duties with the Bears, Dutch was also an active player for the team from 1922 through the 1927 season. On May 18, 1928, Dutch married Florence L. Brunkow of Dubuque, Iowa. Both Sternaman and Halas also worked other jobs to support themselves, especially in the off season. Sternaman sold real estate and insurance, owned bulk oil service stations, was a salesman for Bauer and Black [sports] Supply Company and for a very brief time was manager of the newly-formed Chicago Blackhawk hockey team. Even with the signing of All-American “Red” Grange, the Bears had an increasingly difficult time breaking even. The Great Depression made things worse and the franchise could not support two families. In September 1931 Sternaman and Halas agreed to buy one or the other’s half of the team. According to the Sternaman family, the arrangement was that their bids would be sealed and that only Sternaman, Halas and their attorneys would be privy to the financial details. The agreement of the buy-out was that high man buys at his price. Halas submitted the winning bid of $38,000 and no one, except for those at the meeting, ever knew what Sternaman’s bid was. From that point on, Dutch Sternaman had no connection to the Bears. As president of the Public Service Petroleum Company he operated gasoline service stations and a heating oil and supply company in the Chicago area. In 1936 and 1937, and again in 1948 Dutch coached football at North Park College in Chicago. Edward C. “Dutch” Sternaman died just before his 78th birthday. He is buried at Mount Emblem Cemetery in Elmhurst, Illinois.